but it also left a part of them behind. When I saw �Shovel Buddies� a while ago, I decided to add the item �Watch movies with Bella Thorne playing in it� to my to-do list. Now, I have a large number of to-do lists in the meantime. I could wallpaper my living room with it. In short, too much talk and too little action. I was pleased to see at the beginning of the film that she also participated in �I still see you�. The only thing that surprised me was her appearance. Not such an adorable, fresh looking, and stunning appearance as in the first mentioned film. No, this time she�s an alternative looking, rebellious goth chick with raven black hair and sturdy shoes on her feet. Such a type of girl you�d encounter in a pub full of smoke and doom music. The only thing missing was a piercing through her eyebrow and lower lip. And yet you can catch a glimpse of that lovely face with those sparkling eyes through the mascara. I myself was such an alternativo in times long past and I knew girls who looked like this. But believe me. There were quite a few scarecrows between them who used the thick layer of make-up as a camouflage. Bella Thorne, on the other hand, remains a ravishing appearance. Maybe her lips look rather botox-treated. But otherwise, she�s a very attractive looking young lady. Especially when she�s a wearing a T-shirt braless. But enough about Bella Thorne. There is also the movie. Just like in �Shovel Buddies� we are dealing here with deceased fellow humans. Something Veronica (Bella Thorne) is confronted with in her daily life. And not only Veronica. People worldwide see the victims of a scientific fiasco in which a laboratory imploded. An implosion that made people disappear within a mile radius, after which they re-appeared as holographic images in society. Somewhat like the shadows that remained behind of the people who were present in Nagasaki and Hiroshima when the atomic bomb fell. So these aren�t phenomena as Cole could see in �The Sixth Sense� or Thomas in �Odd Thomas�. Cole and Thomas saw real spirits. In �I still see you� it�s visualized memories that appear daily at regular intervals, performing the same routine all the time. Until you touch them and they disappear with a plop. They are immutable appearances without consciousness that have no influence on daily society. Until one of them appears in the bathroom where Veronica is taking a shower. It tries to tell her something life-threatening is going to happen. And that�s what�s similar to the aforementioned films. Namely that entities from the hereafter warn the main character that something is about to happen. Anyway, these appearances are part of today�s society. Kids at school are having lessons about these �remnants� as they are called. They are remains from the past. The only thing I didn�t understand very well, was the presence of people from an ancient past. I add �I still see you� to the list �horrors for teenage girls�. There�s certainly no trembling and shuddering while watching such films (such as in �Happy death day� or �Before I fall�). So, don�t expect screaming teenage girls running out of the movie theater. And there�s also a bit of romance in this movie so that this target audience can daydream a bit. At first, I expected an exciting film with paranormal and ghostly events. In retrospect, it�s sort of a Nancy Drew-like film in which Veronica tries to solve the mystery of a so-called serial killer with the help of fellow student Kirk (Richard Harmon), who�s really interested in these �remnants�. Although the movie is filled with sometimes beautiful images and you can call the story highly original, it�s all in all a bit disappointing. The start was promising. But as the film progressed it all became rather superficial. And guessing the ultimate outcome wasn�t so hard either. 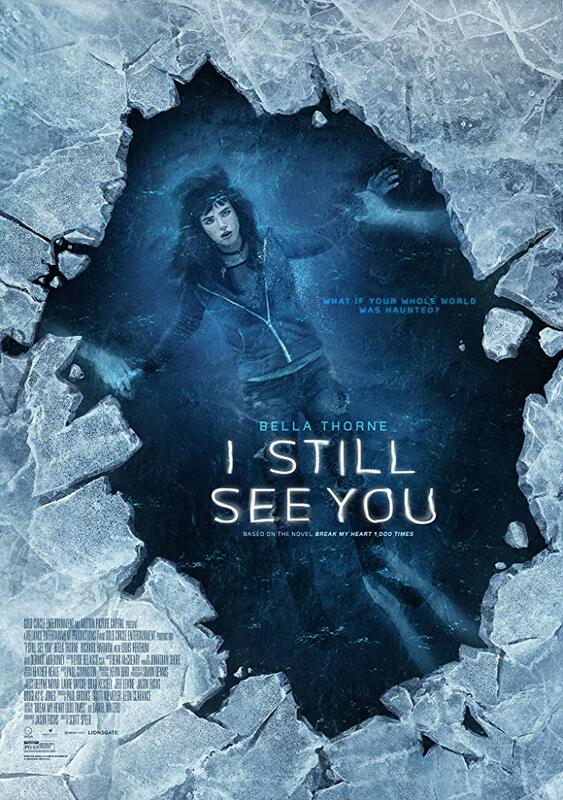 �I still see you� is indeed a movie suited for teenagers who are sitting anxiously close to each other while watching. For me, it was just like watching a political debate. Always the same and nothing special.